Not only is "It Never Rains in Southern California" my least-favorite R&B song from the early 90s - it's my reality. Our reality. And if I see one more warm-temp-flaunting Facebook post - #socaljanuary #ilivehere #suckstobeyoubackeast - I'll have no choice but to post a piece of my "tree vs. forest" lecture. Here's the thing: by "tree" I mean...YES, today is beautiful. All by its lonely self, today is basically beautiful. I'll give you that. BUT by "forest" I mean...NO, today is not beautiful. Because everyday has been like today - rainless. And it's January, folks. We need snowpack in our Sierra Nevadas if we SoCalians want water to trickle down into our lakes. And water for our infinite number of landscaped hillsides and rose gardens and fruit trees. Oh, and to drink! Kind of important. Besides, do we really want to revisit the 80s drought slogan, "If it's yellow, let it mellow?" Confused by my "tree vs. forest" analogy? 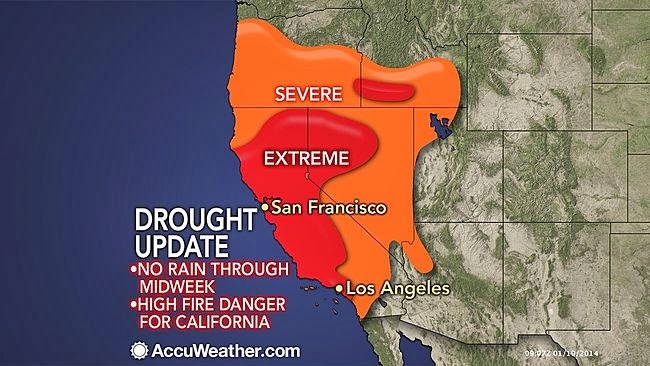 Well at least CNN and FOX are catching on because all week they've been talking about our severe drought. Earlier this month it was kind of cute, us having sunny weather for the Rose Parade... again. And how the nation rolled their eyes at us... again. But now, I think we're gaining the country's sympathy. But if I have to round-up compassion for California by taking myself straight into the Arctic Vortex's core, which I'm pretty sure is centered directly over an amazing Bed-and-Breakfast set among rolling acreage with covered bridges and acoustic sounds and fireplaces and scones with lemon curd (See Primitive Lifestyle Dreams), I WILL DO IT. I'll be super charming and prove to them that we Californians are, like totally, worthy of snow-which-equals-water-which-equals-not-dying, too. Now don't think for one second I'm ranting because I'm bitter about not being able to cozily wear those infinity scarves I got for Christmas. BECAUSE I AM. But I also think constant 84 degree weather in January is messing with my brain. To me, winter equals a high of 58 and a low of 37 (maybe I won't enter the eye of the Arctic Vortex), mixed with a rainy Alaskan front moving in overnight, snow levels dropping to 3,500 feet. So as I sit here and stew over this odd weather (in a very dry, brothless stew), I find comfort in knowing that our unseasonably BORING and potentially longterm-BAD weather hasn't escaped God's attention, for he is a God who sees both today (one tree) and all of our days (the forest) - and has everything under control.